Many people that come to our website often ask the question, ‘What is a Solenoid Valve?’ Well to help you out, will explain everything you need to know about Solenoid valves, how they operate and their functionality. 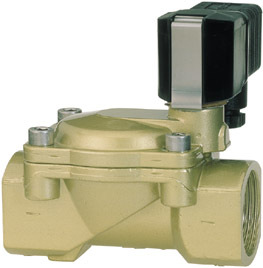 A solenoid valve is an electro-mechanical valve that is used to control the flow of liquid or gas. The solenoid starts by converting an electrical signal into a mechanical movement. The signal is then sent to a coil and the movement then occurs inside of the valve. Solenoid valves are usually be described as pilot operated or direct operated / direct acting. Two Way Pilot Operated Solenoid Valves have two chambers separated by a diaphragm. The upper chamber is connected to upstream through a pilot hole in either the cover or diaphragm. The media exerts a pressure that acts on the upper side of the diaphragm and keeps the valve closed. When the coil is charged the core lifts off the orifice seat allowing the operating chamber to de-pressurise. The thrust of the upstream pressure under the diaphragm continues, lifting the diaphragm and opening the valve. Pilot operated solenoid valves only operate with a suitable upstream pressure differential and do not operate at zero pressure. Also a minimum pressure differential across the valve is required to keep them open or closed. Pilot operated solenoid valves can provide high flow rates at high pressures with lower power consumption. Two Way Pilot Operated Solenoid Valves with Assisted Lift work similarly to pilot operated solenoid valves but the diaphragm is coupled to the moving core. At low pressures when the coil is energised the diaphragm is lifted directly by the moving core. At higher pressures the diaphragm is assisted by the internal pressure in the valve. These valves can operate at zero pressure differentials but are not available in the normally open configuration. How Do Direct Acting Solenoid Valves Work? Direct acting solenoid valves do not use a diaphragm, their seal is part of the moving core. Two Way NC Direct Acting Solenoid Valves have a spring that holds the core against the seal. When the coil is charged the spring is overcome and the seal is lifted from the orifice seat thus opening the valve and allowing the media to pass through the valve. Two Way NO Direct Acting Solenoid Valves have a fixed core which usually in the bottom section of the armature tube. The armature is located in the upper part of the valve. A stem passes through the fixed core and is coupled to the seal. This is held off the seal by means of a spring and makes a seal when the coil is energised, thus closing the valve. Three Way Direct Acting Solenoid Valves work in almost the same way as a two way direct acting solenoid valve. The fixed core has an exhaust orifice running through it. The plunger has an upper seal and lower seal allowing flow to or from either the body seat or exhaust. 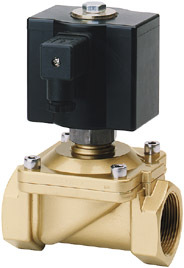 Direct acting solenoid valves are used when there is no line pressure applied. Typical applications would include a cleaning line when a pump supplies bursts of water through the line. A direct operated solenoid valve would remain closed, even when no pressure is being applied (i.e. in between the busts of water). This is in contrast to a pilot operated valve, which requires some pressure for the valve to stay closed. If you have any other questions on how different types of solenoid valves work, please leave you comments below, send us an enquiry or ask our panel of experts in the Solution Centre. MGA Controls are a leading Control & Instrumentation company delivering high-quality products and services to the industry since 1986.